In August 2017, the Ahola Corporation celebrated 50 years in business. Founded by Chet and Rheta Ahola in 1967, the Ahola Corporation has grown to offer not only Payroll Processing, but an entire suite of Human Capital Management tools for business owners. Today, Ahola is owned and operated by the second and third generation Ahola family. 1967 – Keypunch Services is founded by Chester and Rheta Ahola, as a broad based information management service. 1970 – Keypunch Services changes name to The Ahola Corporation. 1974 – Ahola’s client list expands, clients now include: Deluxe Checks at Central National Bank, Master Charge, American Express, Hillside Dairy, United Airlines, Stouffer’s Foods, the Kennedy Mint, the City of Cleveland, and Chrysler. The Ahola Corporation also provided NASA with keypunchers. 1977 – Chet begins using PC processing rather than mainframes, by purchasing early Radio Shack and Dell personal computers. 1980 – Mark Ahola, the oldest son of Chet and Rheta’s children, takes on the executive leadership. Chet and Rheta’s son Scott works as a programmer and daughter Marja becomes office manager. 1984 – Jeff Ahola comes back to work for the company, and changes the core business strategy to a service more preferable for their clients — outsourced payroll processing — and implements a marketing approach. Ahola then has 42 payroll customers. 1992 – Ahola is recognized by the IRS for successfully filing over 500,000 documents electronically and without error. 2002 – Ahola’s services reach 3,300 clients in 44 states, managing over $1.5 billion of payroll, and processing nearly 2 million payroll checks annually. 2002 – The Ahola Corporation led the way in technological advancement by moving from DOS processing to Windows with their original software program, Generations. Generations, developed in-house, gave Ahola many options and capabilities not available in the previous system. 2005 – The Ahola Corporation Michigan Sales office is opened in Lansing. 2006 – Generations Hybrid Payroll Technology is released, containing Ahola’s groundbreaking new product Family Pay. 2011-Ahola expands its service offering to include a cloud-based human capital management, iSolved. 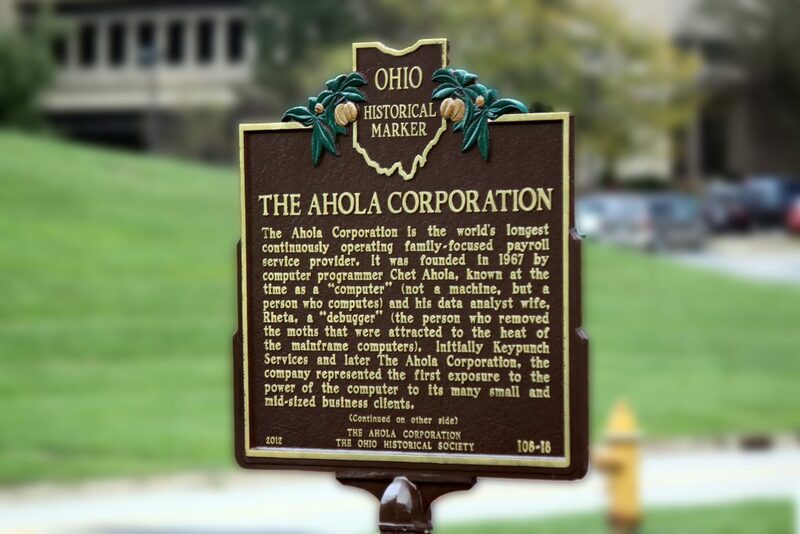 2012-Ahola is honored with an Ohio Historical Marker and is recognized as the world’s longest continuously operating family-focused payroll provider. 2016-Third generation Ahola family member, Sonya Ahola joins the company in Marketing. 2017-Ahola celebrates 50 years in business in August 2017.